First Name: A value is required. Last Name: A value is required. County: Select a County Aberdeenshire Anglesey - Sir Fon Angus - Forfarshire Argyllshire Ayrshire Banffshire Bedfordshire Berkshire Berwickshire Brecknockshire - Sir Frycheiniog Buckinghamshire Buteshire Caernarfonshire - Sir Gaernarfon Caithness Cambridgeshire Cardiganshire - Ceredigion Carmarthenshire - Sir Gaerfyrddin Cheshire Clackmannanshire Cornwall Cromartyshire Cumberland Denbighshire - Sir Ddinbych Derbyshire Devon Dorset Dumfriesshire Dunbartonshire - Dumbartonshire Durham East Lothian - Haddingtonshire Essex Fife Flintshire - Sir Flint Glamorgan - Morgannwg Gloucestershire Hampshire Herefordshire Hertfordshire Huntingdonshire Inverness-shire Kent Kincardineshire Kinross-shire Kirkcudbrightshire Lanarkshire Lancashire Leicestershire Lincolnshire Merioneth - Meirionnydd Middlesex Midlothian - Edinburghshire Monmouthshire - Sir Fynwy Montgomeryshire - Sir Drefaldwyn Morayshire Nairnshire Norfolk Northamptonshire Northumberland Nottinghamshire Orkney Oxfordshire Peeblesshire Pembrokeshire - Sir Benfro Perthshire Radnorshire - Sir Faesyfed Renfrewshire Ross-shire Roxburghshire Rutland Selkirkshire Shetland Shropshire Somerset Staffordshire Stirlingshire Suffolk Surrey Sussex Sutherland Warwickshire West Lothian - Linlithgowshire Westmorland Wigtownshire Wiltshire Worcestershire Yorkshire Please select your county. Phone Number: A value is required. Email: A value is required.Invalid format. 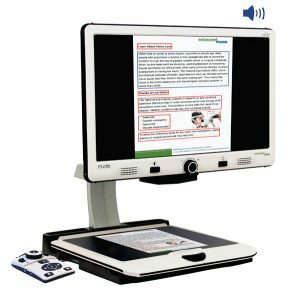 Merlin elite Pro is a high performance desktop video magnifier (CCTV), featuring a Full HD Sony® 1080p camera and Full Page Text-to-Speech (OCR). Merlin elite Pro’s high definition camera displays crystal clear images in vibrant color and contrast while its high resolution LCD and large field of view produce maximum detail on a clear bold display. With the push of one button Merlin elite Pro allows you to change from live image mode to full page OCR mode to have it read your favorite article or book aloud. 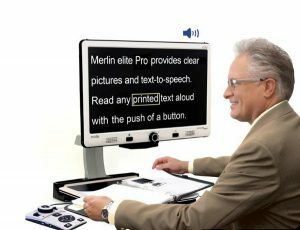 Merlin elite Pro is a perfect solution for anybody looking for a powerful all-in-one electronic magnifier. The file size of an OCR scan varies based on text density. 1000 full page scans at minimum can be stored on Merlin Elite Pro.